As announced last week, a new bill has been introduced in the House to “provide that silencers be treated the same as long guns.” That is, to essentially remove them from the purview of the National Firearms Act of 1934 (NFA) and ease the cumbersome process of acquiring one of these valuable safety devices – a process that involves a lengthy wait and a $200 tax on top of the cost of the device. 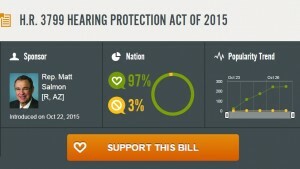 Matt Salmon (R-AZ), introduced HR 3799, the Hearing Protection Act of 2015, to the house on October 22nd. There, it was Referred to the Committee on Ways and Means and to the Committee on the Judiciary for consideration. The full text of the bill, as well as updates about its progress, is available here. The National Rifle Association (NRA) announced almost immediately their full support of the bill. GunLink also fully supports HR 3799 and urge everyone to contact their representatives and ask that they also support the bill, which is co-sponsored by Frank Guinta (R-NH), John Carter (R-TX), Mike Kelly (R-PA), Chris Collins (R-NY), Glenn Thompson (R-PA), Tim Huelskamp (R-KS), Trent Franks (R-AZ), Mia Love (R-UT), Doug LaMalfa (R-CA), Chris Stewart (R-UT), Scott DesJarlais (R-TN), and Bruce Westerman (R-AR). An easy way to contact your representatives is to use the tools at the PopVox HR 3799 page. From there, HR3799 proponents can choose to support the bill. Be sure to include a personal message about why you support the bill. By including your personal message about why you support the bill, you guarantee that the PopVox system will generate a physical letter of support that will be hand delivered to your representatives’ offices. You can also discuss the Hearing Protection Act of 2015 on the GunLink forums. The Akins Accelerator is back! This time with no continually biased springs to rile up the BATFE. To commemorate its phoenix-like rise from the bureaucratic ashes, let’s take a look back at a part of the device’s history. What follows is an open letter from William Akins, inventor of the Akins Accelerator. This letter was originally published on now-defunct Blogspot blog Red’s Trading Post in December 2007. Let me draw your attention to a process known as bump firing which is exactly what my stock allows you to do except my stock stays stationary whereas in bump firing the entire firearm including the stock moves. Bumpfiring uses no devices of any kind. It is a skill or knack as it were, that the shooter learns. Before I go into it, I would like to mention that if you read the illegal BATFE 2006-02 ruling that bans my accelerator device, that same ruling actually bans the process of bump firing and therefore any semi automatic capable of bump firing. Read the 2006-02 ruling at the BATFE website, then come back here and look at what I am about to show you. To bump fire, you hold the weapon very loosely with your right hand and put your finger against the trigger without actually pulling it yet. Then you pull forward with your left hand concentrating on keeping forward tension on your left hand. By doing so you pull forward on the weapon and push the trigger against the right hands trigger finger which fires the gun, which recoils allowing your finger to actually stay in contact with the trigger but allows the trigger to come back forward and reset, but remember, you are keeping forward pressure with your left hand on the fore end of the stock again pushing the trigger into your trigger finger. Actually according to the BATFE ruling, the hellfire and tac trigger should be more illegal than my device since both those devices have your finger RIDING the trigger back and forth and never releasing from it, whereas my device causes your finger to completely disengage from the trigger for each shot. So why are two rapid fire devices that clearly fall within the new BATFE ruling allowed but mine is banned? Politics. Here’s a few links to videos showing bump firing without any kind of device at all.